If you have any interest in Hollywood history and love Tinsel Town lore, this comprehensive biodoc about the life and career of Roger Corman, the legendary ‘King of B-movies,’ will entertain and fascinate you — even if you’re not a big fan of the B-movie genre. Roger Corman, now in his 80s, and his wife and career-long producing partner, Julie Corman, rank high on the list of the world’s most prolific movie makers. They’ve produced and released as many as nine feature films during the course of one year, and only very few of their projects have failed to turn a profit at the box office. During his more than six decades on the job, Corman has actually played a major role in shaping the contemporary film industry. He has literally hundreds of film titles to his credit, including the dozens of low budget, do-it-yourself, one take is all you get so get it right schlock horror and exploitation films with which he began his independent filmmaking career. Despite their questionable (or unquestionably bad) production values — or maybe because of them — those early films attracted a very loyal fan base, one that assured Corman’s success in the movie business. Beginning in the 1950s and for more than a dozen years, Corman worked with American International Pictures (aka AIP, but the company actually began with the name American Releasing). He’d had no formal training as a filmmaker. He just jumped into the job and figured it out as he went, always setting his own production pace and style. During the 1906s he began to make more serious movies with a bigger budget and received critical acclaim for his cinema adaptations of the work of Edgar Allen Poe. In The Intruder (1962), he took on the very serious subject of race relations in the southern US. For it, he won a prize at the Venice Film Festival, but it was his first commercial flop. But, as you learn in the documentary which chronicles Corman’s career chronologically, the legacy of the ‘King of B-movies’ was quite clearly not only schlock. That’s especially evident when it comes to the roster of filmmakers and actors who got their career starts by working on Corman projects. Included in their number are Francis Ford Coppola, Martin Scorsese, James Cameron, Peter Bogdanovich, Joe Dante, Ron Howard, Jack Nicholson, Robert De Niro, Peter Fonda, William Shatner and Sandra Bullock, among many others on the Hollywood A-list. Many of them pay tribute to Corman in on camera interviews in this star-studded documentary. In speaking about his debt to Corman, an uncharateristically emotional Jack Nicholson practically breaks down in tears of gratitude. Additionally, Corman deserves credit for introducing the work of many of the world’s finest film directors to American audiences. When he left AIP and formed New World Pictures, Corman began to import and distribute the films of Ingmar Bergman, Akira Kurosawa, Federico Fellini, François Truffaut and other first rate international directors in art house cinemas across the United States. Actually the documentary is rich with archival footage and on camera testimonials that reveal Corman to be an extremely smart, straight shooting and sophisticated gentleman who deserves a lot more credit and praise than people who don’t particularly like B-movies are likely to give him — until, of course, they learn more about the man and his achievements in this better than B documentary. 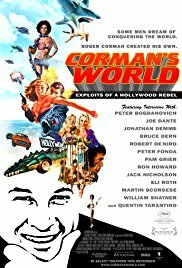 Put Corman’s World: Exploits of a Hollywood Rebel on your documentaries watch list.